The UK is considered to have the highest rates of morbidity and mortality among children and adults with asthma in Europe. The National Review of Asthma Deaths (NRAD) (2014) found that 28 children died in the UK because of asthma between February 2012 and January 2013. Most of these deaths would be considered preventable by many respiratory specialists. The British Thoracic Society (BTS) and the Scottish Intercollegiate Guidelines Network (SIGN) produces an asthma management guideline on a biennial basis. This joint working has been in practise since 2009. The guideline is made available for comment by a variety of respiratory health professionals working in primary and secondary care before it is published on the BTS and the SIGN websites. The guideline provides recommendations based on current evidence for best practice for managing asthma in adults and children of different ages. It emphasises that the expertise of clinicians seeing children with probable asthma is vital to correct diagnoses and subsequent treatment options. The 2016 update focuses on supporting health professionals to make accurate diagnoses, and provide effective treatments to reduce unnecessary morbidity and mortality associated with asthma. The section on diagnosis has been completely revised. There are updates in the pharmacological management of asthma, self-management, non-pharmacological management of asthma, acute asthma, difficult asthma, occupational asthma, and organisation and delivery of care. Diagnosing asthma in a younger child can be particularly difficult. The guideline emphasises that there is no single test to make the diagnosis. 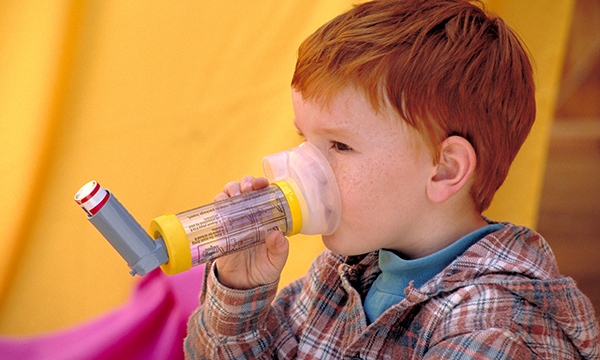 Spirometry is one of the diagnostic tools that is recommended in children of five years and older. It is used often in secondary care, but should only be undertaken by practitioners with expertise in performing spirometry and dealing with children. It should then be analysed with the history. Asthma should be considered a complex condition, the variability of the symptoms over time makes the diagnosis difficult. It is recommended that, if a health professional suspects asthma, he or she should undertake a structured clinical assessment based on a combination of patient history, examination and tests to assess the probability of asthma. Patients can then be classified into one of three groups: high probability of having asthma, intermediate probability of having asthma and low probability of having asthma. The treatment and management options are then summarised for each group. The stepwise approach to treatment remains, but rather than the steps being numbered there are descriptions. The importance of trial of treatment and review has been highlighted in the summary of management in children. The idea that treatment should be increased and decreased according to the symptoms is still apparent. There is still clear guidance on when to refer to secondary care for specialist advice and support. Much of the advice highlighted in the guideline mirrors the recommendations made in the NRAD (2014). Examples of this are the importance of each person with asthma having a written, personalised asthma action plan, the crucial role of correct inhaler technique and high standard, consistent education about asthma. Even though the guideline should not be considered as a standard of care, it can assist specialist nurses in aiming to provide high standards of care for children with asthma and their families. All nurses who care for children with asthma should have a reasonable level of training, and awareness of the basics and complexities of this disease. Parents of children with asthma often mention the inconsistency of advice given to them, yet these guidelines are clear. Not all nurses will need to have in-depth knowledge of the guideline, but they should endeavour to ensure that the advice they give is correct. To this end, it is suggested that all nurses caring for children with asthma are aware of the vital role they play. They should be certain that they know correct inhaler technique, use available asthma action plans and signpost people to further advice as indicated.